Parents know that gizmos, gadgets and gears attract little hands and with this in mind, Contigo – the leading producer of innovative water bottles, travel mugs and kids water bottles – has designed a new hydration product for even the most inquisitive child. The Contigo Autoseal Gizmo Sip water bottle was designed to keep kids hydrated, healthy and clean with a unique lid featuring bright colours and engaging mechanisms that make hydration both fun and functional for the whole family. The Gizmo Sip is outfitted with Contigo’s patented Autoseal technology, which makes the water bottle 100 per cent leak- and spill-proof for kids ages three and up. Kids simply press the button to drink and release the button to automatically seal the water bottle between sips, preventing accidental drips and spills. In addition, parents love the spout cover, which keeps out dirt and keeps the mouth piece protected when not in use, as well as the easy-clean lid that flips open to make the bottle easy to clean quickly and thoroughly. The lid and body are both top rack dishwasher safe with no loose parts to misplace. Driven by a recent survey in which over half of parents said they prefer a “mechanical fun” feel for kids reusable water bottles, the Autoseal Gizmo Sip design puts the fun in functional with colourful internal parts that move with the press of a button, a transparent lid that gives glimpses of the internal workings of the water bottle and a soft handle that’s comfortable for kids to use. 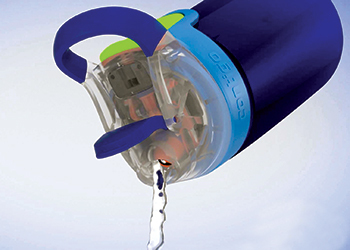 The Autoseal Gizmo Sip is BPA-free and has a 14 oz drink capacity. Chicago-based Contigo, a Newell Rubbermaid business, is a leading producer of innovative, leak-proof beverageware. Many Contigo travel mugs and water bottles feature the revolutionary Autoseal patented technology.